Our team is one of the most experienced in the industry. We cover the complete range of a phosphate project including geology, mining, beneficiation, sulfuric acid, phosphoric acid, fertilizers, and related products including fluorides, uranium, and rare earths. Chuck has 35 years’ experience in the process design and operation of chemical plants in various areas of the chemical industry. He is currently responsible for development of process technology, design, and all aspects of engineering at KEMWorks. 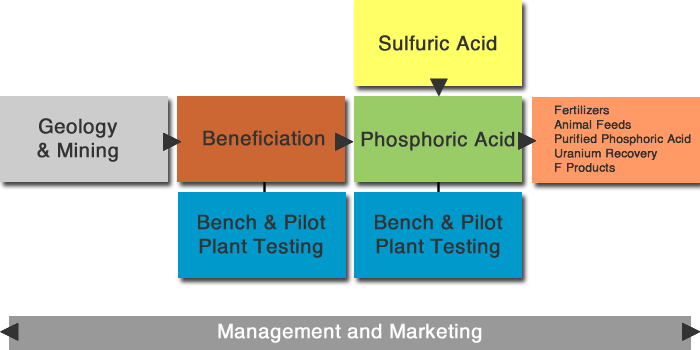 Chuck has developed process design packages (i.e., heat and material balances, PFD’s, P&ID’s, equipment specifications, and operating manuals) for fertilizer, petrochemical, food, and pharmaceutical industry. He was Project Manager on several detailed engineering projects on fertilizer plants has also been involved in commissioning, start-up, and troubleshooting of many of these plants including a DAP plant in Morocco in 2008. Roberto has 27 years’ experience in fertilizer plant management, operations, projects, and engineering. He will manage our new subsidiary – KEMWorks Brasil in São Paulo. He worked for several of the major Brazilian fertilizer companies, including: Vale as an Internal Process Consultant; Bunge, as Engineering Manager; and Fosbrasil, as Operations Director and Industry and Technology Manager. He has expertise in phosphoric acid, food-grade phosphoric acid by solvent extraction, DAP, MAP, and SSP. Roberto has also supervised phosphoric acid pilot tests for Vale. He was Planning Manager of the Bunge start-up team during commissioning of BMP complex in Morocco and has experience in phosphate operations in the Americas and Europe. Paco has more than 35 years’ experience in both industrial and academic aspects of metallurgy, leaching, and mineral processing. Dr. Sotillo started his career as a foreman at a mining company and is now a recognized expert in the beneficiation of phosphate rock and sulfide ores. 1995. Dr. Sotillo is the author of 36 publications on sulfides, phosphate, coal, and metallic oxide ores. His awards and honors include the Peruvian National Mining Award in 1986, and the Bronze Crucible for the best International Technical Paper, VI National Congress of Metallurgical and Materials Engineering, National University Jorge Basadre Grohmann, Tacna, Peru. He also received the Peruvian Mining Award, Institute of Mining Engineers of Peru, 1986. John has more than 37 years’ experience in the fertilizer industry. He began work as an Industrial Chemist at Fisons Fertilizers (now Yara) and became the Production Manager at Plymouth, UK. He later worked in the Central Technical Services Unit working directly for the Production Director. He was responsible for process trouble shooting in all the granulation units (14), three Superphosphate units, twenty bulk blending units, and was also involved in all the other process plants including sulfuric acid, nitric acid, phosphoric acid and ammonium nitrate. He has started-up six granulation units and two MAP/DAP plants in Brazil, Uruguay and Turkey, and during this period was responsible for the basic process design and/or feasibility studies for granulation projects in Turkey, Cyprus, Poland and Yugoslavia. Neville has more than 30 years’ experience in the mining industry in both underground and open-pit operations. He has been involved in all aspects of the mining life cycle, including hands-on operating experience, operational management and executive management. He has managed feasibility studies from discovery hole and definition of an initial resource, through to commencement of development and operation and has also undertaken many due diligence exercises. He has been heavily involved in the approvals process and stakeholder engagement for several projects. He has extensive experience in a diverse range of commodities including phosphate, fluorspar, gold, nickel, zinc, lead, copper and diamonds. He is responsible for coordinating our projects in Australia. Neville can be contacted directly at Neville Bergin & Associates Pty Ltd.
Jamie has nearly ten years of experience in process engineering. Jamie’s experience includes development of material and energy balances, PFDs, P&IDs, equipment specifications, and compiling cost estimates for beneficiation, sulfuric acid, phosphoric acid, and granulation plants. She has experience developing, performing, and supervising pilot plant and lab testing for phosphate projects including new process concepts and technologies. Jamie also has experience performing energy studies and energy optimization for several new process technologies in the phosphate field. She has served as lead process engineer and project manager and was involved with project coordination for large multi-office and international projects. Wes is responsible for the development of material and energy balances, PFDs, P&IDs, and equipment specifications. He is also responsible for developing and supervising lab and pilot testing in our beneficiation pilot plant. Wes has five years’ experience in operations, process control, and technical training. He was a Process Engineer at Mosaic Fertilizer’s New Wales, Four Corners, Hookers Prairie, and South Fort Meade facilities. He helped refine flotation plant processes at Four Corners mine, managed initial designs and business case evaluations while working closely with project engineers on over $35 million of capital projects for flotation plant upgrades. He was previously a Research Assistant at USF College of Engineering and spent six years in the US Navy as an Electronics Technician, Nuclear Field – 1st Class Petty Officer. Mr. Kendili has 36 years’ experience in the phosphate fertilizer industry, including 32 years in the Office Chérifien des Phosphates (OCP). He has held several senior positions at OCP including: Director of Safi Morocco site; Director of SMESI Engineering, a subsidiary of OCP; Strategy and Development Director; Director of Joint Venture Projects; Quality and Safety and Environment Manager; Manager of Abu Zaabal Egypt Project; Senior Project Manager for mineral exploration project in Africa. Mr Kendil is responsible for managing projects for KEMWorks in north Africa. Rick is owner of an engineering and consulting group formed in April, 1991 specializing in sulfuric acid processes and co-generation. His firm has established clients representing significant corporate interests including General Chemical Corporation,Tampa Electric Company, MECS Global, Mosaic, Factory Mutual, PCS Phosphates, Otto H. York Company, and the U.S. Federal Court. He has provided evaluations for future co-generation projects and provided technical assessment reports to MECS Global and Otto York. He participated in due diligence reviews of co generation facilities and the potential sale of phosphate complexes, and has provided expert testimony as a court appointed expert. In addition to operating his own company he has held posts Acid Engineering & Consulting, and at Occidental Chemical Corporation where he was Sulfuric Acid Area Manager. Wes has provided consulting assistance for projects, especially those involving new technologies, unique business development concepts, product enhancement opportunities, and component waste recovery. He was one of the developers of the solvent-based uranium recovery process for Mosaic (then IMC). He was instrumental in developing novel techniques for the extraction of metal salts by the application of proprietary ion exchange, continuous chromatography, and solvent extraction approaches. He was the developer of a continuous ion exchange machine and holds over 20 patents in uranium recovery, ion exchange, solvent extraction, and acid purification. Wes operates a pilot plant for testing ion exchange technology. Kim Thompson has over 15 years engineering experience in process engineering, phosphoric acid and sulfuric acid plant operation, quality control, and environmental testing and permitting. Kim has 9 years’ experience working for US Agri-Chemicals fertilizer plant leading to the position of Manager of Process Engineering and Quality Control. Kim has experience in environmental engineering and has performed air testing and ground water monitoring, air permitting and air and noise modeling. Mike is an industrial mechanical/piping/structural designer and an experienced 3D AutoCAD user since 1986. He is familiar with P&ID drawings, piping and structural design and details, industrial plant project standards, following OSHA / MSHA standards. He has been employed by engineering and operating companies, including: C.F. Industries, Jacobs Engineering Group, Davy McKee, and Proctor and Gamble. His areas of expertise include aggregate (rock) and sand, fertilizer, kaolin, beneficiation (phosphate mining), pulp and paper, ammonia loading, steam, sulfuric acid, phosphoric acid, granulation, fume and dust collection, and conveying systems. He is also well-versed in CEMA standards for design and detailing of belt conveyors. Allen Freeman has more than 40 years’ experience in all aspects of project controls from cost engineer to manager of the Project Controls department at major contractors. His experience includes chemical, petrochemical, fertilizer plants and water treatment facilities. He has prepared estimates including direct costs, indirect costs, and home office costs. He has also played a continuing role in a project in the form of trend forecasting services to inform the Project Manager and/or client of the cost effect of and proposed or approved changes in the scope of work. He was Manager of Estimating at Jacobs Engineering Group, Pegasus, and Davy McKee. Fred has over 30 years’ experience as a Control Systems Engineer implementing analog and digital instrumentation and control systems for chemical, petrochemical, and fertilizer plants. He has extensive experience in the design of distributed control systems (DCS) including supervisory control, report generation, process graphics, data logging nad has also performed field start-up assistance, commissioning, calibration, and system validation and documentation. Fred was Plant Manager for a phosphoric acid plant in Mexico for six months. He was Lead Controls Engineer at Jacobs Engineering Group, and Davy McKee. Sam has extensive experience in all phases of phosphate processing programs, including pilot plant equipment fabrication and set up for beneficiation and phosphoric acid testwork. Sam is our troubleshooter for anything involving electronics, computer or mechanical problems. He has more than 10 years of experience in set-up and running of beneficiation and phosphoric acid pilot plants as supervisor, operator, and analyst. Sam Prentice is also a senior designer with experience in mechanical and piping design. He has designed and drafted flow sheets, piping and instrumentation drawings, process equipment arrangements, and detailed mechanical equipment design. He is proficient in AutoCAD 2014, AutoCAD 3D, AutoCAD P&ID, and MicroStation. Art is a former senior executive of International Minerals & Chemical Corporation (now Mosaic Co.), AMAX Chemical Corporation and Helm Fertilizer Corporation. He has multi-industry success in: business consulting; problem solving; project management; domestic and international marketing; mergers and acquisitions; due diligence investigations; business start-ups; product development; international trade, logistics and distribution; strategic and tactical planning; and structured financial transactions. He recently served on the board of directors of Asia Pacific Resources, Inc., a Canadian company engaged in the development of a new potash mine in Thailand. His company A.J. Roth & Associates was founded in 1985 and has provided proprietary consulting assistance to more than 85 clients in the United States, Canada, Latin America, Europe, China, India, Thailand and Japan.